Hello everyone! It's my turn to post over at Trendy Twine today. We are showcasing the Valentine Cherry Cupcake Trendy Twine this month. It's still on sale for 2 more days, so miss out! I have 2 3x3 Valentine cards for you today. These were really quick to put together. The weather has been rainy so not the best pictures for you today--sorry! 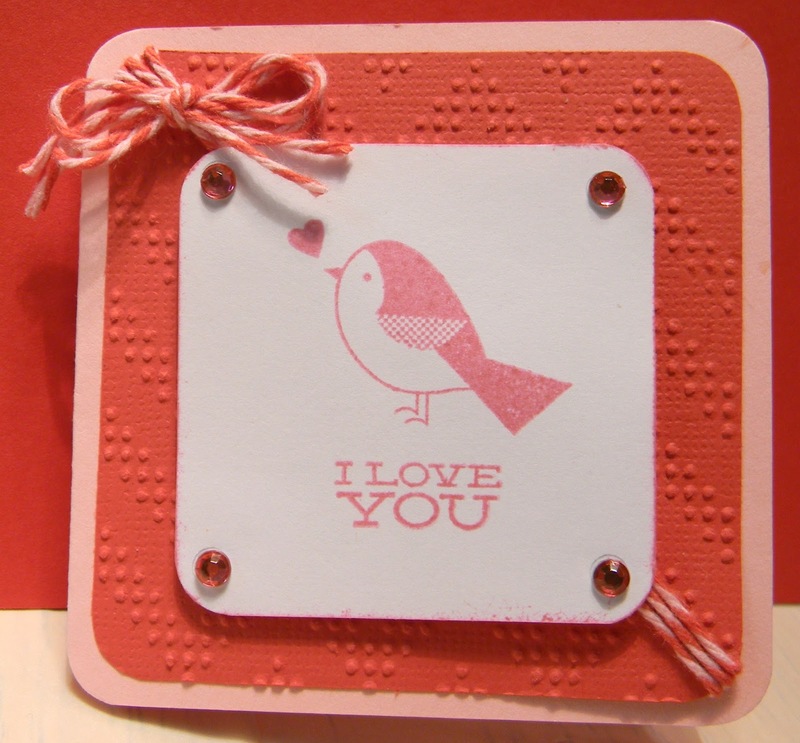 I love the chevron Charles Cuttlebug folder I used on the second card and the bird stamp is from Close to My Heart. There is a lot of tape on the back of the Valentine Cherry Cupcake Twine on an angle, but I really like the look :) I really wanted to show you something more fabulous, but I have been sick for a week, but it's not the flu, thank goodness! So cute Helen, I like how you wrapped the twine around the heart! 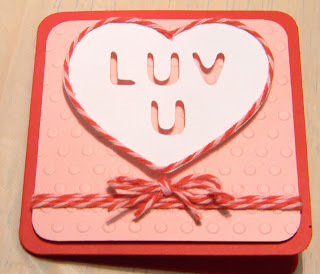 Cute cards, Helen, I love the embossing folders, they add so much texture! Oh, these are so adorable, Helen. I think tiny cards are the cutest. The I love you heart with the twine is perfect and I just love the texture. these are so adorable!!! I LOVE these mini's!! Awesome heart! Great cards, great job. What a cute CAS card! I love making 3x3 cards and yours are fantastic! Beautiful.